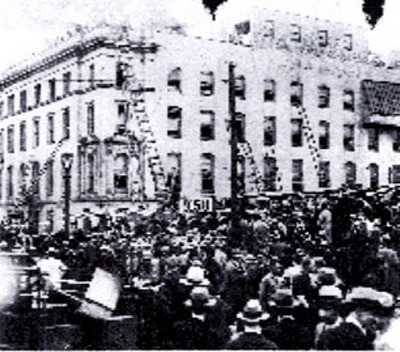 The Cleveland Clinic fire was a major structure fire at Cleveland Clinic in Cleveland, Ohio on May 15, 1929. It started in the basement of the hospital and it was caused by nitrocellulose x-ray film that ignited when an exposed light bulb was too close to the film, causing poisonings and two separate explosions. The fire claimed 123 lives, including that of one of the founders, Dr. Phillips. The first explosion came at a few seconds past 11:30AM; a clock on the third floor balcony stopped at that time. Despite the heavy loss of life, firemen estimated the property damage at only $50,000. Policeman Ernest Staab was killed by the gas while rescuing 21 victims. Poison gas and two explosions which followed burning of X-ray films in the Cleveland clinic today claimed nearly 100 lives. Tonight there were 98 known dead and hospital authorities worked desperately to administer artificial respiration to 43 others who were overcome. Victims of the disaster were dying at short intervals and physicians sent out appeals for additional oxygen in the fear that the supply in the city might prove insufficient. Oxygen is declared the only effective means of overcoming the gas burns. Nearly all of the deaths were attributed to the deadly gas which filtered through the four story brick building slowly at first and then, augmented by a second and greater explosion than the first, rushed up from the basement and cut off escape down the stairways and elevators. A catastrophic fire at the Cleveland Clinic in 1929 impacted fire-fighting practices and hospital procedures in Ohio and across the United States. 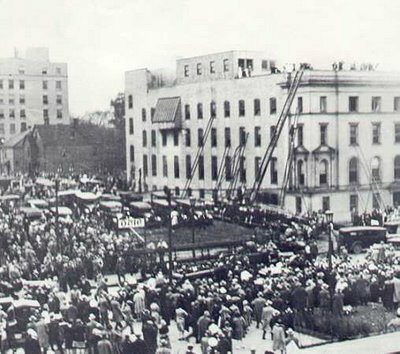 On May 15, 1929, the main building of the Cleveland Clinic caught fire. The fire began when an exposed light bulb was too close to some nitro-cellulose x-ray film, igniting the film. In the end, 123 people lost their lives. Eighty of the dead were either patients or visitors at the clinic, and the rest were employees. One of the Cleveland Clinic's founders, Dr. John Phillips, was among the dead. Most of the victims died from inhaling poisonous gases produced by the burning x-ray film. At 11:35 in the basement of the Cleveland Clinic, at 93rd Street and Euclid Avenue, Cleveland, a stock of X-ray films exploded. At that hour there were 234 people in the building. Within 15 minutes about 100 of them were dead, with many more dying. The first explosion was followed by a second, greater one. Glass was blown from the windows. The force of the explosion blew out a skylight and the descending fragments fell through a shaft upon the people seated in the waiting room three floors below. Plaster showered from walls and ceilings. A heavy yellow gas poured through the building. Doctors, nurses and patients sniffed it and fled. Some seated in chairs took a long breath and died without moving. Some reached the windows, prepared to jump, but billows of gas enveloped them and they fell back dead. Others succeeded in leaping from the first and second story windows. Some limped away. Some lay writhing in agony and died upon the lawn, for the gas followed them even into the open. Passersby upon the street collapsed.